More and more these days there are ways of learning about mindfulness and the meditation practices that support it. There are apps, YouTube videos, online classes and a multitude of mindfulness classes and drop-in centers offered to the public. What makes a Mindfulness Based Stress Reduction (MBSR) class different? The original curriculum was designed by Jon Kabat-Zinn in 1979 when he was a professor at the University of Massachusetts Medical School. The curriculum has evolved and been refined over the past 40 years and is certainly the most well-researched program among the Mindfulness Based Interventions currently available. While it is clearly rooted in the early Buddhist teachings, the languaging of the class is purposely free of Buddhist terms and as a result it has been taught in many different types of institutions ranging from hospitals, government agencies, schools and many different settings and has a general appeal to those who, at least initially, do not have an interest in the more spiritual side of these practices. It is a secular, educational program, an adjunct to medical or psychological care. Many of the apps, and other training models offer guidance in short practices which while having some benefit only go so far when it comes to alleviating the root causes of stress. It’s one thing to find some tranquility in a 10-minute practice, it’s quite another to begin to see how habitual behaviors contribute to one’s stress reactions through one’s own direct experience and investigation. Wisdom develops over time through dedicated practice. 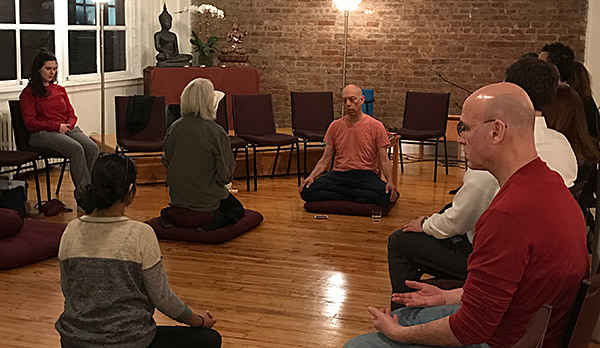 While one learns various forms of meditation in an MBSR class, the magic really happens when there is the integration of mindfulness – unconditional kind and purposeful attention into many aspects of one’s life. When someone enrolls in an MBSR class, there is a commitment to show up for 8 weekly 2.5 hour classes as well as a full day of practice. Just as important is the commitment to do the daily formal practices of 30-40 minutes and to make other activities in one’s day part of practice. This is a big commitment and for the first few weeks might create more stress (Mindfulness Based Stress Production!) but as the practices become integrated into life, the transformation starts to take hold. Each weekly class becomes a refuge for individuals and the daily practices begin to make sense. Over the course of the 8 weeks, the class itself becomes a community and the experiences which are shared from week to week are an essential part of the process. The class itself becomes the teacher and the wisdom learned by one has the potential to become wisdom gained by all. As a teacher of MBSR I take heart in seeing participants transform over the course of these 8 weeks. In the closing circle at the end of a recent cycle participants expressed this transformation – I learned to clear out stress which makes rooms for energy and joy. . . I learned that I could be nicer to myself and find a sense of colm when things are not going the way I would like them to. . .I’ve learned to practice patience with myself. . .meditation makes me a better person and that my thoughts are not who I am. . . That I can make the choice to change. If you’re interested in MBSR classes, you can start by reading about MBSR here. Start by taking a MBSR Orientation Class. After attending one of the orientation classes, you can then sign up for a MBSR course here.